I'm not quite sure why I didn't post this two years ago, when we were first transitioning to Alabama, but I ran across it today and found it's still true. We have moved once more since then, although his job has stayed the same. Yep! Sometimes we choose to move when He prompts us, and it's not involving a job change. Now it's 7 moves in the past 9 years. Each time God has sold our home within 30 days of listing it (and closing it in a timely manner). Nothing says we heard God right, than when He does that for us. We don't know if/when we'll move again, we love it here! However, we're remaining committed to serving Him wherever He leads, and if that means another job change, or house change, or a move for any particular reason that He wants to point out, I'll trust Him with the details and go again. I hope it's not for many years though! Now it's been 35 years of marriage, and those grandkids equal 10 (not 9), and 7 of them are living in another country. We still live far from the remaining 3, but it's not so hard. Well, yes it is. I miss them. I think I'd miss them wherever we were though, wherever they were living, if it wasn't close by. Still, we have to choose the hardest thing, whether it's leaving a house, a job, a life well lived, a friend well loved. We have to choose to walk in faith, trusting that whether we are planning our departure on a trip, losing a job, or facing end of life illnesses, we have to walk in the knowledge that we will not walk the road alone. He will go before us, with us, and come behind us. He will not leave us. I know the drive is boring, but I make myself push through the miles to be by my husband's side at his most recent hotel by dark. He has worked all day, and despite my map blunder, I arrive barely before the sun sets into the hills. The hotel room seems small to me, a little run down, but safe and inviting still. I'm exhausted and sore and slightly wobbly from all the car time. I'll find my feet by morning and all will be well. I sleep hard, and awake before his alarm goes off, but I've mistaken his normal 4:30 alarm for the 5:30 he set it for, and end up being awake for over an hour while he sleeps. He rises and dresses and heads out the door. I fold my pillow from home in two, roll on to my tummy, and slip down to the bottom of the bed so my toes can hang down, just like home. THIS is when I sleep the best, after he's gone and before my day must begin. My dreams are vivid and deep and I feel well rested when I wake up next. I've got time to linger, and after the quiet of my room I hurry downstairs, afraid to miss the breakfast offered. My husband returns from work and joins me over bacon and eggs and yogurt and fruit. We're looking over the list of homes we'll tour with the realtor, and by the time we're done eating, the realtor has arrived. We let him chauffeur us around town, looking at homes in neighborhoods and hillsides and lake fronts and precariously perched as if balancing on cliffs. With each one we view, I try to look beyond the paint colors and worn floors, past the peeling wallpaper and cluttered shelves, to imagine my life here. I wonder how my kitchen table will fit in, where the light will sprinkle in through the windows. I try to get a feel on this sunny winter day, will it be too dark in the house when the leaves fill in? Will I see birds come when my feeders are relocated here? Are there neighbors that will go beyond the steep drive to say hello and bring a plate of cookies? Where will I walk to pray over my neighborhood, when there are no sidewalks? Can I steal a look at the lake if we clear the underbrush, and can we even get permission from the TVA powers-that-be to clear it? So many questions and technicalities for houses we won't even make an offer on today. The search is just beginning. I've been here before. No, WE have been here before. We have done this ritual with other houses in other cities our whole married life. This is our sixth state to live in, over the lifetime of our marriage. This is our sixth move in seven years of working with this company. If you count the temp apartments and short-term rentals (like a month or two, here and there) I *think* we've had at least 22 addresses during our 33 years of married life. When I was a kid, I liked to travel. I still love taking the road less traveled, though usually it's just a day or two with my camera in tow. I like to eat at local places, get to know the culture and history. Truth be told, I'm a sojourner at heart. I love moving. Usually. My last move was emotionally really hard, and I didn't want to move. The circumstances of the job change were not on our terms, and I had to leave the area closest to 9 of my grandkids, 7 of them that we lived about 5 miles away from. 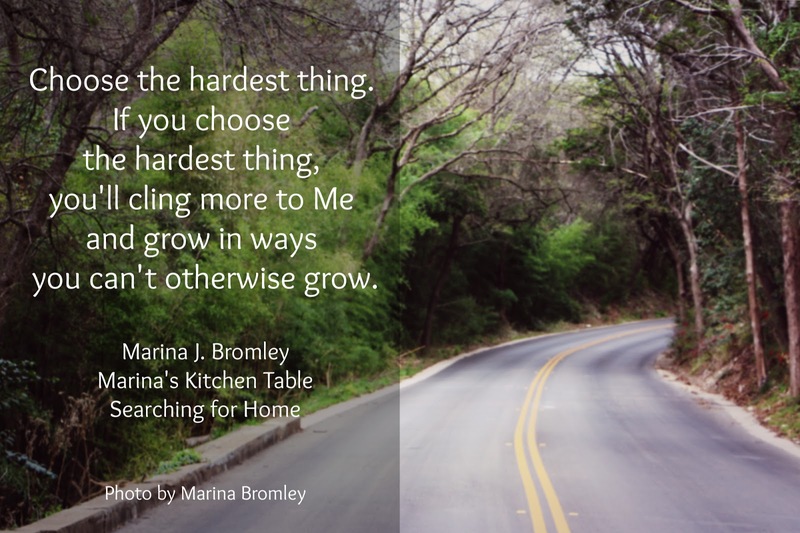 It was HARD, but even as I set my jaw with tears in my eyes and drove down the road, I remembered the words I clearly had heard God tell me just a few months earlier, "Choose the hardest thing. If you choose the hardest thing, you'll cling more to me and grow in ways you can't otherwise grow." It feels a bit like juggling. Each ball represents all the aspects of a move. The home, neighborhood, friendships, church, and then work—with aspects of job responsibilities, relationships, mentoring, all the new things that have to be learned. Over our 33 years, we are juggling those 6 states we've lived in. 22 moving balls that represent the people we went to church with, co-workers that stay in touch, girls I've mentored and co-workers he has, pushing things into a different order so I can find room for the new people I still want to meet here. I throw the balls higher in the air to keep them moving. They may not be in my hands as often, or for as long, but I'm still keeping them in my life! This is where the sojourner kicks in, and my adventure begins. I know not to hold my hand too tightly around a house, a church, a child or a friendship. I know not to ask for the promise of "Let's not EVER move again!" as it becomes an instant reminder of Who is in charge of the number of days in any town or job or home. I know that everything can be changed in a house, besides the neighborhood and the physical footprint. It might cost dearly to remodel, but it can be changed. Everything else in life is temporary, and it can change so quickly. Everything can change, except His great love for us. ©2019 Marina J. Bromley, Marina's Kitchen Table, all rights reserved.